Last November, before my oldest son even had his driver's license, he bought his first car! Some people who used to go to our church, but never knew were selling their 40th Anniversary Ford Mustang. We had been looking and test driving cars for months. I was glad to get away from a car lot and to an individual. 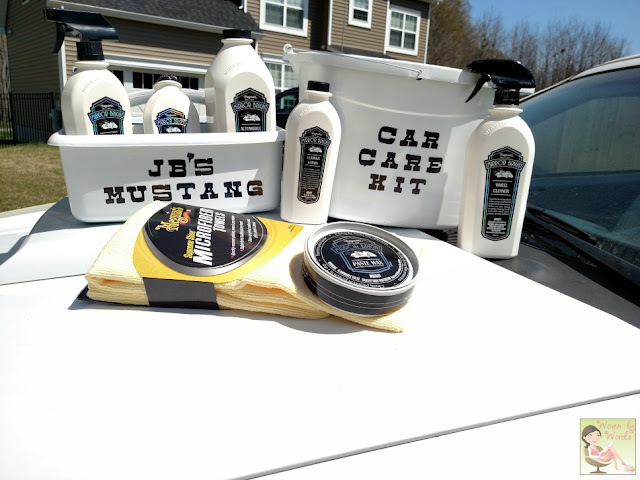 Thankfully my son is babying his car, which is why I reached out to Meguiar's to see if they would partner with me. One of my goals as a mom was to pass on my love of cars to my son, just like my dad passed on his love of cars on to me. For this kid to have a 2004 convertible as his first car, I feel like I've done my job! 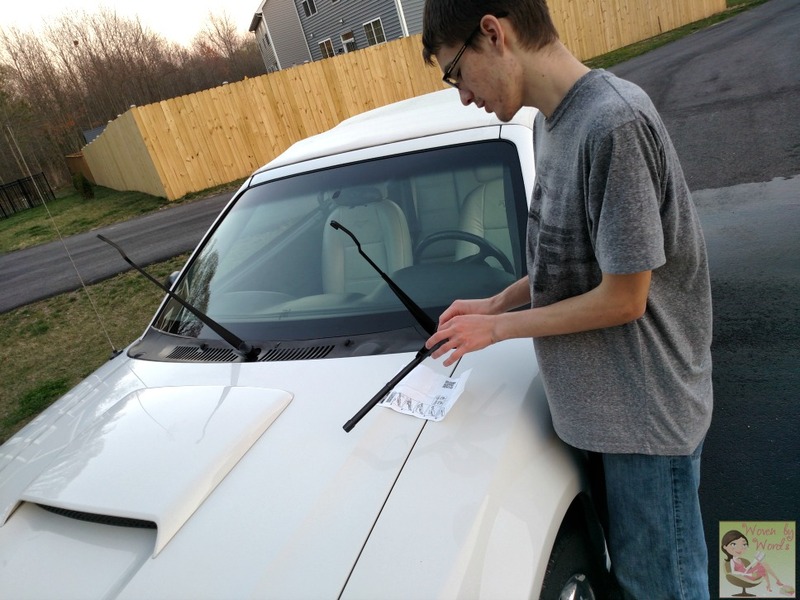 Teaching him to take care of his car with the right products was my next task. Automobile Shampoo: for all automobile finishes, including modern clear coats and is perfect for regular use on all car surfaces. Polishing Wax: that combines polishing and waxing into one, time-saving step to reveal maximum gloss, depth of color and mirror-like reflections. 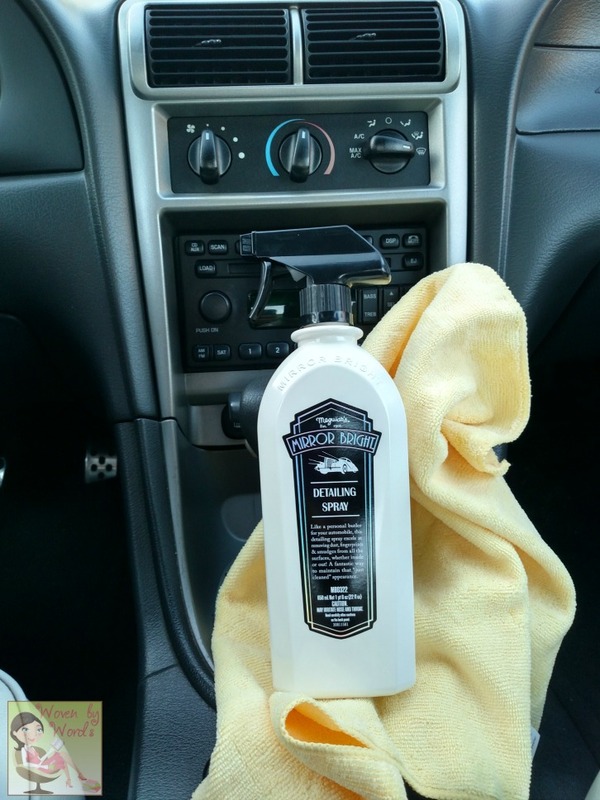 Detailing Spray: a true multi-task product that gently cleans both exterior and interior automobile surfaces and finishes. Wheel Cleaner: for safe application on all wheel and brake finishes including chrome, polished aluminum and painted. 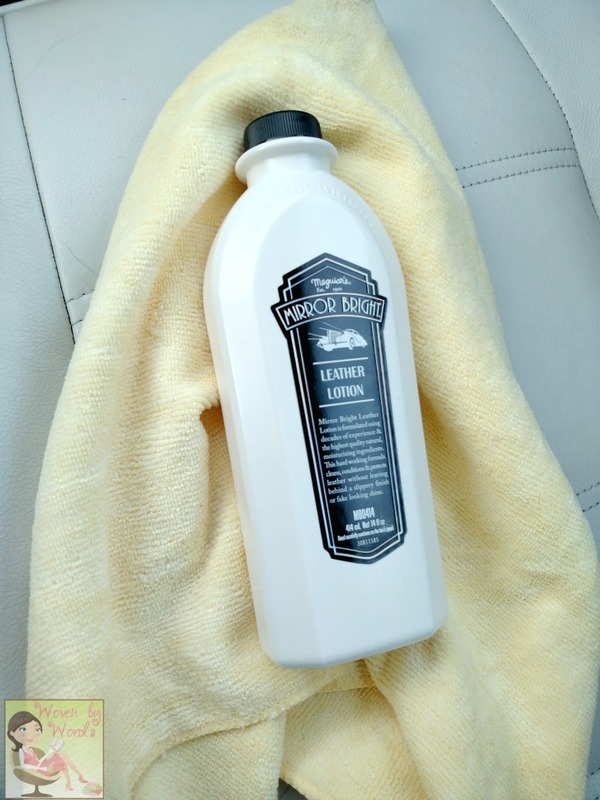 Leather Lotion: which cleans, conditions and protects leather in one simple step for a lasting soft and supple feel and low-sheen and UV protectant. Polishing Paste Wax: that cleans, polishes, and protects, removing light swirls and oxidation and providing the paint with lasting protection, all in one easy step. The next step was waiting for a nice day out, my son not having a busy evening, and some shade. Thankfully this week has proved to be simply gorgeous, but as we didn't want to wash his car in the full sun, we had to find that golden hour where it's still nice out, but the sun hasn't completely set. Our house faces the sun most of the day, which is usually a bonus! I surprised my son with a DIY I did the day before. I had bought the pieces I needed to get it done last week so I'd be ready for a good evening to surprise him with it. I'll get to the DIY in a little bit. Of course he started out rinsing the car off. I hadn't realized it, but the pollen has been terrible the past week or so. That meant his car was covered in it since it hadn't been in the garage. Yikes! He's in the process of learning how to get the car washed and waxed the right way. You know how it is when they're little and they just love helping mom and dad wash their car? Well, now he gets to do it the right way. While he washed and dried his car piece by piece, I went inside to work on some detailing. That must've been the easiest job ever. Since he only recently got his license, it means he's only been driving his car on a very limited basis. That means his interior is pretty spotless. I didn't mind of course because it made my job easier. After I cleaned his dashboard and controls, I started with the Leather Lotion on his seats. One of the things that I really loved about his car is how nearly mint everything is in it. The seats are leather and so far not cracked. The do have wrinkling, but no cracking. I'm hoping this Leather Lotion will keep that from happening. I was able to get one seat done, when I had to get out and help with the tires. He went back after he finished washing his car to take care of the rest of his seats. I had no idea how nasty his rims were until I went to spray them with the cleaner. It's amazing what you see when you get close up. 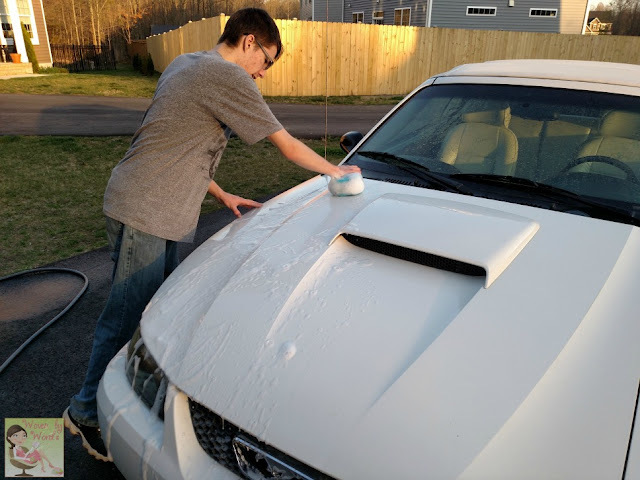 I went around and sprayed each rim as he was finishing up rinsing his car. I thought we had a tire brush, but apparently not. I went around just using the sponge he'd used to wash his car. The grime came off as soon as the sponge hit it. You can see the amazing difference! It actually took a while to get the car washed and cleaned inside and out so today we're going to work on waxing today. 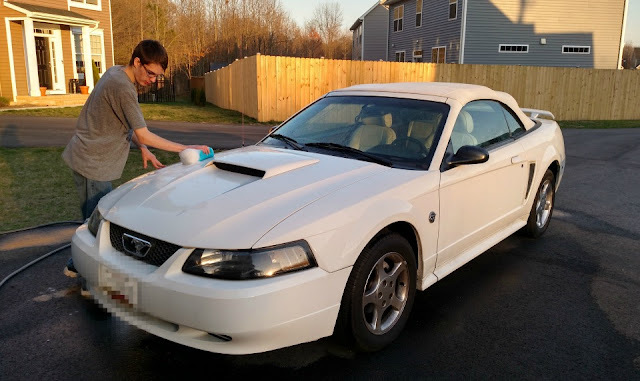 I've never been a car waxer, and as I look back on it, when I lived in MN it probably would've extended the life of the finish of my car. Now, I know that there's a science to waxing, so this will be entertaining. I'm actually having him watch Meguiar's video on waxing a car so he knows when it's ready to be taken off. I'll probably have him watch some YouTube videos because if at all possible I want to avoid the swirling that can come with bad waxing. My hubby and I went out to check out the moon later that night, and when we came back, his lights were shining on the back of my son's car. I'm pretty sure I've never seen a car look so sleek and smooth. 100% not joking. I was a little jealous. I think it's time we wash my car! 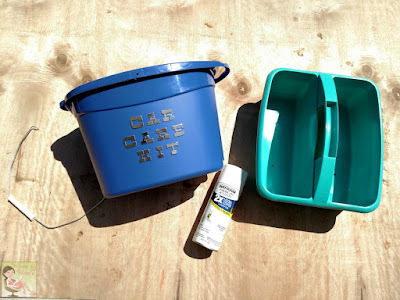 Because my son has a gorgeous white car (I'm not typically a fan of white cars) I wanted to be a little hokey and get crafty with his bucket and supply holder. 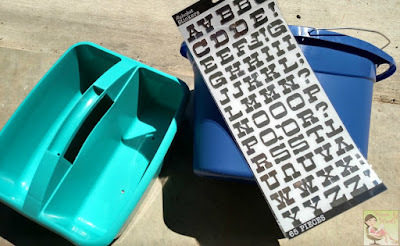 I grabbed some spray paint and letter stickers because I haven't started the vinyl trend yet. So, I didn't do this because I don't always have my ideas all at the beginning of a project, even when I think I do. Because I wanted to match the Mirror Bright colors and my son's car, I decided to paint the bucket and caddy white. What I should've done was spray the black over the section that I was going to put the letters on. That way when I put the letters on and sprayed the white over them, when I pulled of the letters you would've seen black, not the color of the bucket. 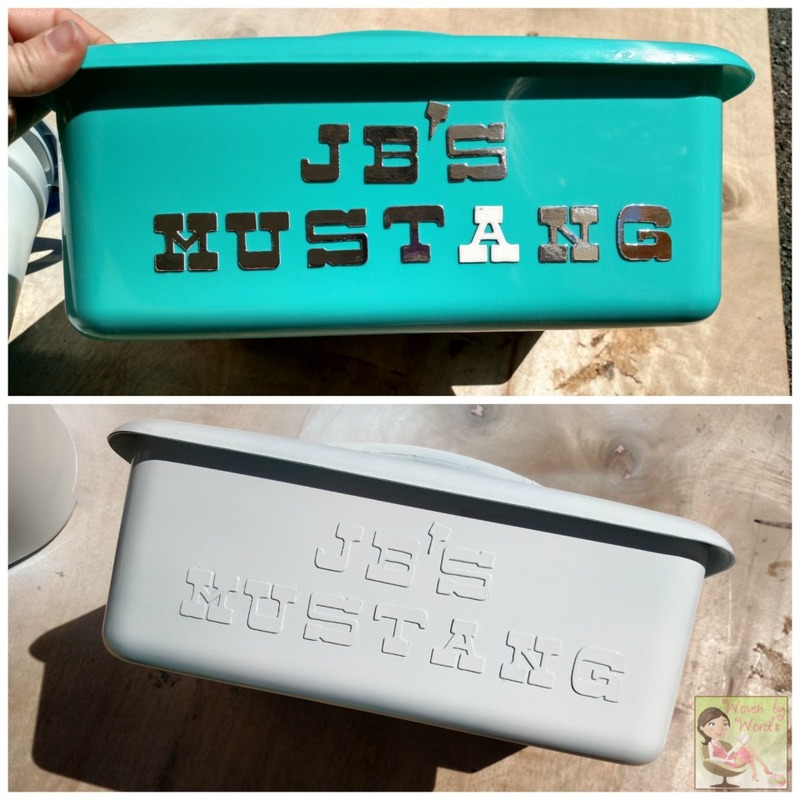 I put the letters on the bucket first and sprayed the white over them. One tip I have with the letters is to remove them before the paint dries. Allow it to dry some, but I found out the hard way if you let it dry completely, it'll peel off some of the white that you want left. I had to go back over them a second time after I'd removed the letters. Since I didn't use the black spray paint initially, I went back and colored in the letters with a black permanent marker. With that done, voila, he has his own personalized car washing care kit! Mom win! 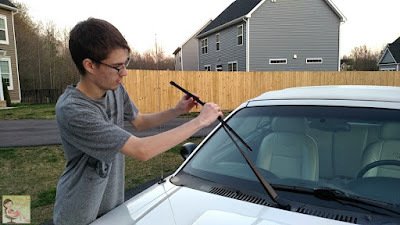 I also taught him how to change his windshield wipers. I'm hoping one of our friends who's good with cars will teach him how to change his own oil. Then when it comes time, I'll have my dad help him learn how to change his brakes. We also hung a ball so that he'd know how far into the garage he can park. Yea, with the convertible he gets to have the garage. Lucky guy! The ultimate leather balm would be perfect for my hubby car! I'd literally try any of those products they all look intriguing! This looks like a great gift! Brenden would love it. I would use the Ultimate Interior Detailer. The front dashboard needs help. I would like to try the Gold Class™ Car Wash Shampoo & Conditioner. I would love to try the Mirror Bright Wheel Cleaner. I can't believe the before and after pictures! I'd also like to try the Deep Crystal Car Wash. I'd like their paint protect! I would most like to try the Hot Rims Wheel Polishing Tool for the rims on my Corvette! They need some TLC. I would love to try the Ultimate Fast Finish on my car. I am a HUGE mustang lover. I hope he enjoys his car! I would use the Keep Clear Headlight Coating on my car's headlights. I would use the Keep Clear Headlight Coating on my car. Hot Rims Metal Polish Would be perfect for my rims! We could really use the Perfect Clarity Headlight Restoration Kit. I use the Ultimate Quik Detailer on a regular basis. Living in the desert, we usuall just need to touch up our cars - this keeps them looking showroom clean! 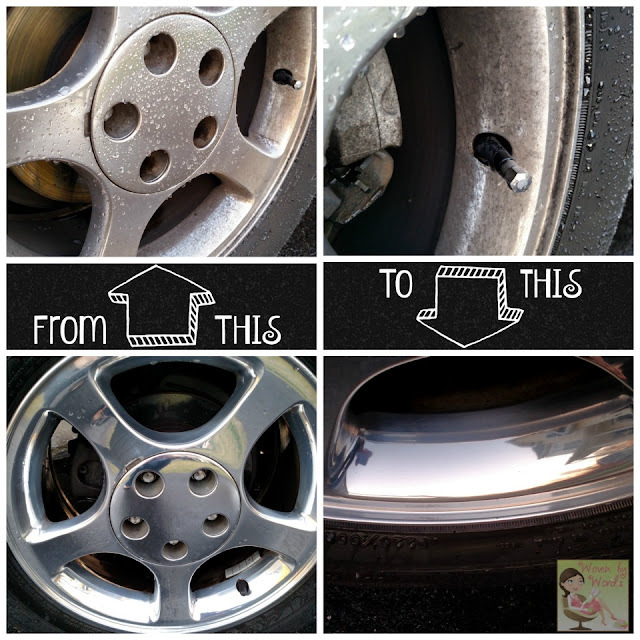 I really like the Hot Rims® Aluminum Wheel Cleaner. I think I would use that the most. I would love to try the DA Powers system!! I would like to try the Ultimate Compound that restores color and finish to neglected finishes. We have an older car that was bought my our son that has a great engine with low mileage but thd paint finish looks terrible. I think this compound might help restore the finish. I drive a lot of dogs in my car. 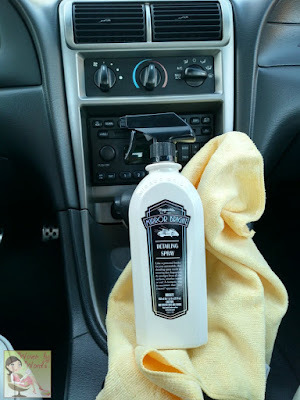 I have three of my own, plus I drive rescue transports, so I'd love to try their Quik Air Re-Fresher - New Car Scent to freshen things up. I would use the Liquid Wax Wet Look on my car. I like the Keep Clear headlight Coating. I hate how headlights get duller the longer one owns a car. I would love to try the New Car Scent Protectant (Wipes). I would love to use the Gold Class Car Wash Shampoo & Conditioner. Perfect Clarity Headlight Restoration Kit.I need to do my headlights badly!! I would also like to try hot shine reflect. I would love to try the Ultimate Fast Finish! I need the keep clear headlight cleaner because my headlights are so frosty. I want the DA power system. I think I need to get the BASIC HEADLIGHT RESTORATION KIT. My headlights seen kind of dull. Keep Clear Headlight Coating, I can't stand when the headlights get cloudy on a car. I'd use the Gold Class™ Rich Leather Cleaner & Conditioner. 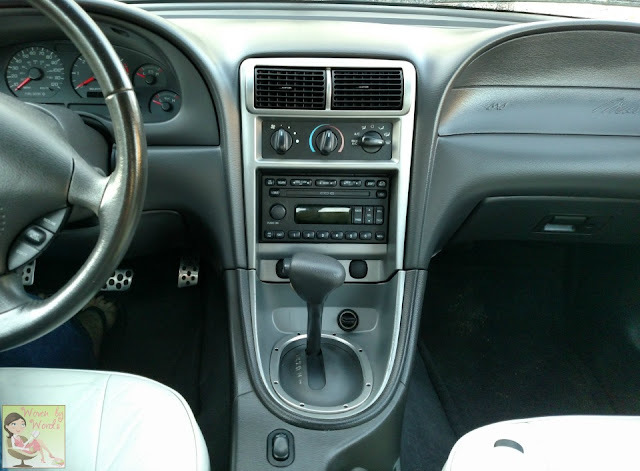 I would love to use the Quik Air Re-Fresher - New Car Scent. I love my car to smell good. I'd use the Paint Protect. It sounds so easy to apply. They have so many great sounding products. One item I would need is the upholstery cleaner in addition to the others. I'd like to have the Quik Car refresher in the new car scent. I'd use the Wash Plus+. 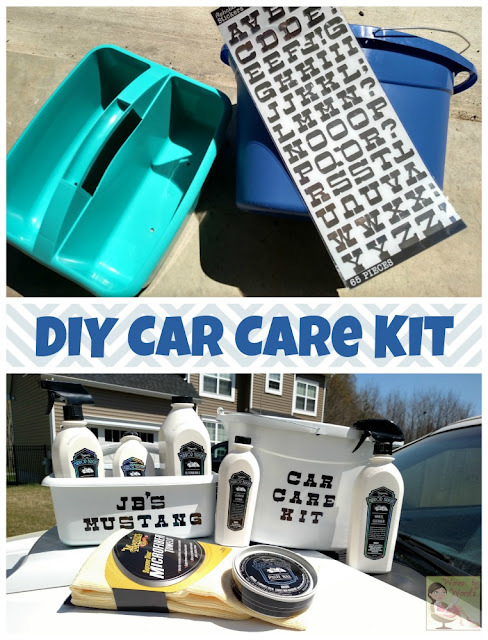 I would love to try the 2- step headlight Restoration kit. I would love for my headlights to not be so dull. I would use the Keep Clear Headlight Coating sounds amazing to use.